Who wouldn’t want to spend Christmas in Mexico? Well, you might not if you realized that it was snowing there too! 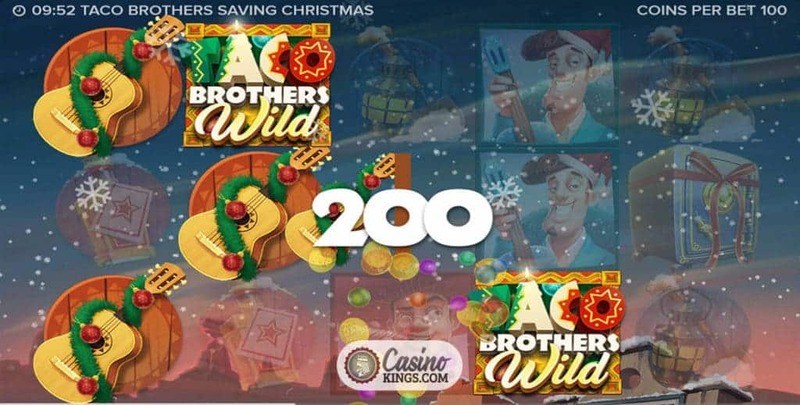 ELK Studios is back for the festively-themed Taco Brothers Saving Christmas Slot game. 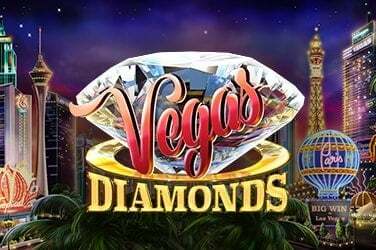 The Scandinavian outfit bringing the weather of its homeland to the once-sunny climbs of the central Americas in this five reel, 243 Ways online slot. Peso, Pepe and Pico return to Santa Maria, the sleepy Mexican village which was plagued by the Machiavellian Captain Diaz. Diaz is back too. Once more after the villagers’ tacos and pesos. Well, our Taco brothers won’t stand for it. And neither will we. It’s Christmas for guacamole’s sake! Fans of the original Taco Brothers will find plenty to cheer here. 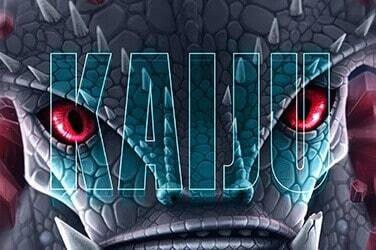 You may be forgiven for fearing that ELK are churning out a shameless, barely-changed remake of a fans’ favourite. But the festive theme actually works incredibly well. All the characters greet us with a Christmas message as we load the game – even Captain Diaz chews on a candy cane pipe. While snowflakes swirl behind and around the reel case. 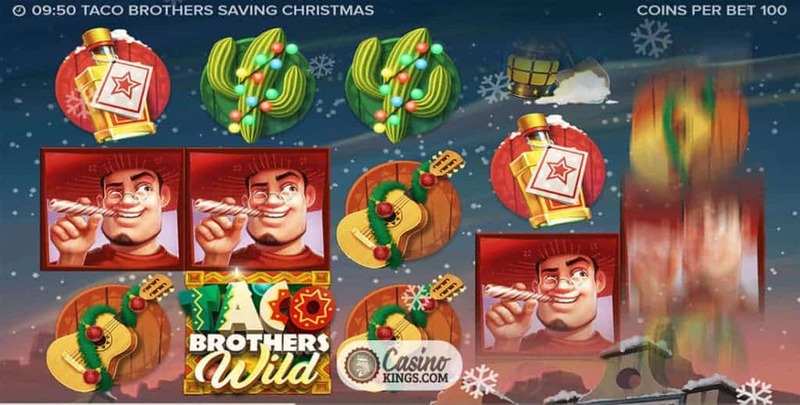 The game’s symbols – Pepe, Peso and Pico, Pepe’s guitar, Tequila, Lantern and Snow Shovel – are given a full festive makeover, bedecked with Christmas hats, gifts, snow, tinsel and lights. Even the Taco Bell Wild is topped with holly. The Taco Brothers game logo is the least-transformed symbol, though it still acts as the game’s Re-Spin Wild. 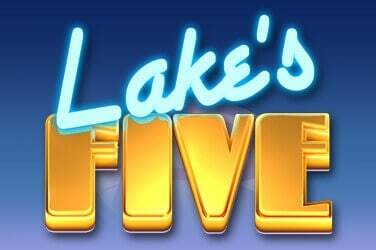 Two of these across the reels will trigger a re-spin to give us a shot at landing the Safe Scatters or any other additional wins. 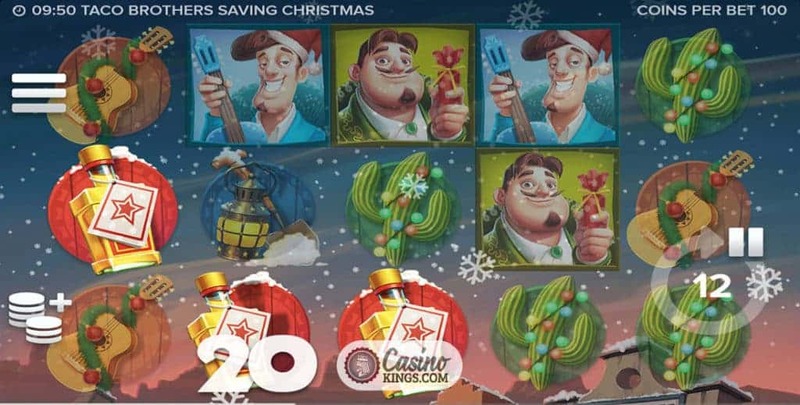 The Safe Scatters are our shot of Tequila that we need to boost our winning potential in the Taco Brothers Saving Christmas Slot. 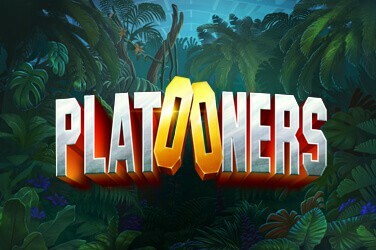 Three or more of these Scatters launches the Wild Escape bonus game. 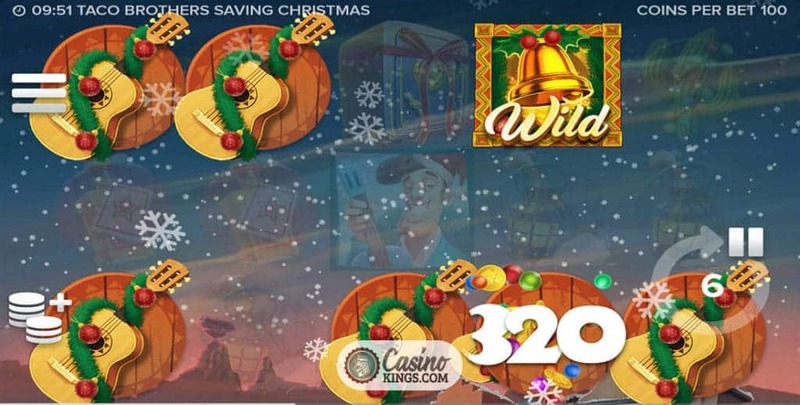 An unknown number of free spins that see Pico, Peso and Pepe scamper across the reels as Extra Wilds during the free spins. To continue the festive theme, carol singers rock us along with festive favourites. Not that Captain Diaz is feeling in the spirit of things. Once more he is determined to be the Scrooge of the piece by locking our heroes up. The Captain’s beautiful Señorita daughter returns to our rescue, potentially breaking our taco-loving heroes out of jail when she lands on the reels. 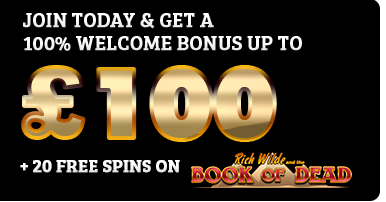 I hope Peso, Pico and Pepe show her the appreciation she deserves when we get past this free spins feature. We hope they buy her a nice present for Christmas. Maybe some gold taco earrings or something? The comedic feel that returns in Taco Brothers Saving Christmas Slot is a festive treat. 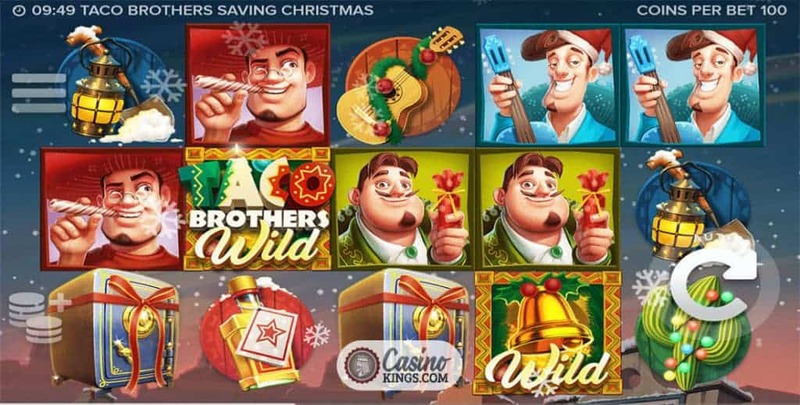 It begs the question – why don’t all other developing houses release Christmas-themed updates of their top online slots? ELK Studios delivers a festive treat that will have us grinning at our laptops and absent-mindedly reaching for the Tequila. Who wants to build a snow cactus?